Markus and Sandro could have been called a successful couple. In the world of western horse, their names were well known − one an American and the other an Italian. They seemed to be the classic gay couple that trained horses. Markus loved bright colors, rhinestones, and wigs. Sandro reputedly had a thing for women too. It was obvious to everyone that the American had a sweet personality, almost feminine, while the Italian often showed a tendency toward aggression, a passion for violence that he also vented on horses. Those things were well known, but no one could have predicted what happened next. At the riding facility near Pavia, clients began to wonder what was going on. Horses that Sandro rode suddenly had spur marks. And then there was the arrival of the French girl, as well as the horse that turned up lame. What or who was raising hell in the stalls of the S & M Performance Horses riding center? What brought Markus to face his past and Sandro to fear for his future? And why did people start to wonder if horses knew how to hate? A powerful story. A book that travels on two tracks, for those who love the novel and fluent reading, for those who like to dig deep into the human soul and its dark sides. Almost all of the characters in this book are suffering from a psychological disorder, or at least live in some form of discomfort which is evident throughout the various relationships that develop between them. The book is set in the world of the horses, the victims designed to endure the suffering of the protagonists. Sometimes the horse becomes the innocent target of so much pain. And it is as devastating as it always is when the weak are exploited and robbed of their innocence. Emotional involvement guaranteed! Sibyl von der Schulenburg is well known for her success in tournaments (shows), but that she writes books only few people know. 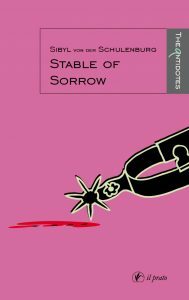 Her latest book Stable of Sorrow is focused on the western show scene and, apart from others, also on “pleasure”. Behind the reserved and polite Sibyl as we know her, a sharp observer and precise analyst hides. As a dentist who places his drill where it hurts the most, she places her sharp pen where the circumstances/situations for our four-legged friends are not fair, by which she literally places a mirror in front of our face. But mostly she tells a story. A story of an American trainer, who stays in Italy because of love. A story of a horse owner who began to doubt the meaning of such tournaments (shows). A story of a rider who lives with her violent husband just because he finances her tournaments (shows). A story of an Italian trainer who literally tries to win over corpses. And if we are made to think about it all after we are finished reading the last page, the purpose of this book is truly fulfilled.